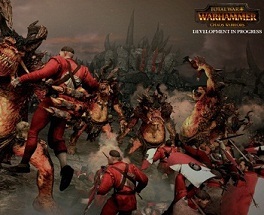 Chaos is one of the major playable factions comes with the pre-order of Total War: Warhammer. This faction also has its strengths and weaknesses. If you decide to go for chaos, then at the very beginning of Total War: Warhammer you can conquer the peoples of the north and get allies. Chaos has excellent melee with decent armor and powerful weapons. In addition, the mobility of this faction is not to be underestimated. Chaos consists of warriors who roam the land and face any enemy they encounter, with the aim to subdue them. Their infantry and monsters are more of their strengths and when you need powerful units against enemy infantry, then the chariot of Chaos are the best choice. The Ranged Cavalry features the lowest range of all political groups and the spear infantry of chaos is very expensive, although it is supposed to protect you from monsters and cavalry of other races. Chaos giant: Armor is not safe from this monster and the infantry simply has no chance. Chaos and Terror preceded this unit. Hellcannon: A powerful and heavy cannon. Chosen: Melee, equipped with axes, they tear their opponents and thanks to strong armor, they take little damage. - Magic: With spells you can counteract the lack of ranged from chaos. - Cavalry Levels: This is actually a disadvantage due to their limited range, however, can counter the flight units of other groups well. - Artillery: Although you can cause great damage to this unit, you will also be much needed to plug it in and the low rate of fire represents a significant disadvantage. - Chaos Giants: This unit has a strong defense and is cheaper than Dragon Ogre-Shaggoths. In addition, it has a higher leadership. Shaggoths turn is faster and has a higher attack bonus. Here, the decision depends on your playing style. - Chariots: Use these units in order to weaken the enemy infantry. So it gives you the opportunity to place you better. If you encounter Chaos as an opponent with another faction, then the infantry will help you. Thus distracts the warrior and let your ranged units to take them from behind. Because of the strong arms of chaos, you will serve with armor-piercing weapons much more damage and also the monster should be prepared for it. Ensure proper counter units for this opponent.